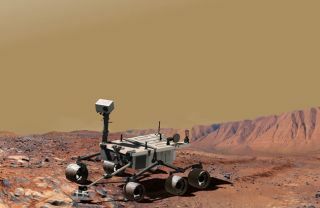 NASA's Mars Science Laboratory (MSL), a mobile robot for investigating Mars' past or present ability to sustain microbial life. To be launched in 2009, MSL is now being eyed for sample caching duties on the red planet as part of a revived NASA Mars sample return initiative. Detecting water underground does not require a magical stick. Neutrons reflecting out of the soil can indicate the presence of water or ice. A novel instrument that can detect those neutrons is planned for NASA's next rover mission to Mars. Because neutrons penetrate most materials, neutron beams and detectors are often used to study crystal structure, as well as explore oil and mineral reserves underground. The same physics motivates the Dynamic Albedo of Neutrons (DAN) instrument, a contribution from the Federal Space Agency of Russia to the Mars Science Laboratory (MSL) that is scheduled to launch next year. The goal of the DAN instrument is to use neutrons to detect water that might be lurking underneath the rover as it moves along the martian surface. "It is important because it will be looking for water -- not in the sense of liquid, but in the sense of H2O in any of its forms," said William Boynton from the University of Arizona. Martian water -- likely bonded to soil minerals -- has already been detected under the surface by previous missions. Boynton and his colleagues hope to use DAN to better pinpoint where and at what depth this water exists. The team described their experiment in a recent issue of Astrobiology Journal. The first planetary science mission to use neutron detectors was NASA’s Lunar Prospector. Launched in 1998, this small orbiting spacecraft observed the possible signature of water under the Moon's poles using an on-board neutron spectrometer. Two similar neutron detectors are on board NASA's Mars Odyssey. This spacecraft -- still in orbit around the Red Planet -- has detected water in the top (1 meter thick) layer of the martian soil, but from its altitude it can only resolve the water abundance over 600 kilometer-wide regions. To have a better understanding of how the water content varies, researchers want to place detectors on the martian surface. Hence, the selection of DAN for the suite of MSL instruments. Not only will DAN have almost a million times higher spatial resolution than Mars Odyssey, its two neutron detectors will also be able to give a detailed depth profile of the water distribution down to about half a meter (1.5 feet) below the surface. Neutrons signal the presence of water by a decrease in their energy. They lose this energy through interactions with the hydrogen atoms that make up H2O. "It is like striking a billiard ball with the cue ball," Boynton said. "If you hit it directly on center, all of the energy of the cue ball (the neutron in this case) will be transferred to the billiard ball (the hydrogen atom)." The net result is that a neutron is stopped or slowed when colliding with hydrogen. Presumably, most of the hydrogen atoms on a planet surface will be part of a water molecule. "Water will both thermalize (slow down) and absorb neutrons, so the reflected neutron signal will be higher in thermal (low-energy) neutrons and lower in epithermal (high-energy) neutrons," Boynton explained. Dry soil, by contrast, will reflect more high-energy neutrons. This is because it will contain predominantly heavier atoms, which act like bowling balls that barely budge when a cue ball hits them. Neutrons striking iron or silicon atoms, rather than hydrogen atoms, will ricochet with practically the same energy that they started with. The DAN instrument will be able to determine the depth of martian water because it controls its own supply of neutrons. Mars Odyssey and Lunar Prospector had to rely on naturally-occurring neutrons for their signal. That's not typically a problem since neutrons are constantly being created by cosmic rays colliding with nuclei in the martian or lunar soil. But DAN will be able to shoot neutrons into the soil -- using a pulsed neutron generator -- and then record how long it takes them to bounce back. This will give some indication of how far down the water is located. "The signal is stronger with the generated neutrons, but the nature of the signal is the same," Boynton said. The two neutron detectors incorporated into the DAN experiment will be sensitive to water levels as low as one-tenth of one percent in the martian soil.